Almost 7 million Americans suffer from a fish allergy, according to the Food Allergy and Anaphylaxis Network. A skin rash resulting from touching or eating salmon fish oil is a sign of an allergic reaction to the proteins found in salmon. Some of the most common fish that cause an allergic skin rash are salmon, cod, tuna, bass, sardines, trout and swordfish, according to Beyond Allergy. A severe allergic reaction to salmon fish oil can lead to anaphylactic shock, a life-threatening allergic condition. Talk with an allergist if you suspect you have a salmon allergy. According to the Mayo Clinic, a salmon fish oil allergy is an overreaction of the immune system to the proteins found in salmon. 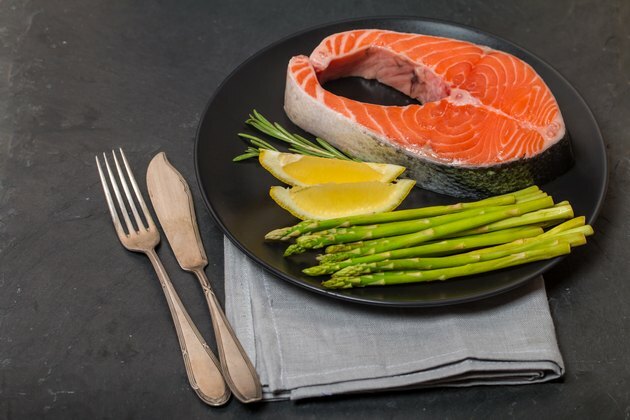 The protein enters the body and is mistaken by the immune system as a dangerous substance, such as a virus and builds a resistance to the salmon protein. Antibodies are formed to fight off the proteins, which trigger histamine production in mast cells. Histamine is a chemical in the body that causes inflammation in soft tissue, such as the sinuses, the lungs and the skin. Skin rash symptoms from a salmon fish oil allergy are inflammation in the skin, swelling, irritation and itching. Hives develop within a few minutes after consuming salmon, according to Beyond Allergy. Hives form in patches of skin and causes raised welts to appear that are flat and clustered. Another common rash that develops is eczema, forming small, red blisters that can weep and crust over. Eczema also forms patches of dry skin that appears leathery. Contact dermatitis may occur after the individual touches salmon fish oil. Other symptoms that may accompany a reactionary rash to salmon are tingling in the lips or mouth, shortness of breathe and nasal congestion. If the patient has a fish allergy, she may experience digestive complications, such as nausea, vomiting and diarrhea, according to the Food Allergy and Anaphylaxis Network. Nasal congestion can cause sneezing, congestion and postnasal drip. If you experience a rash after eating salmon, consider participating in allergy tests for a proper diagnosis. Skin tests and blood tests may be performed to confirm a salmon allergy. After diagnosis, your doctor may recommend removing salmon and other fish from your diet. A rash after eating salmon fish oil can cause anaphylactic shock. Common symptoms include hives, shortness of breathe, a drop in blood pressure, rapid heart rate and confusion, according to MedlinePlus. Call 911 if these symptoms develop.